Small-batch distilleries seem to be de rigueur these days, but back in 1996 that was not the case. That was when Jim Bendis founded Bendistillery and started producing his Crater Lake Gin in Bend, Oregon. It was a jog through a juniper forest that got Bendis’s attention. He had been thinking about the great wine and beer made in Oregon and sniffed out that the untapped distilled spirits industry could be a pathway for him. Named for the crystal clear lake in south-central Oregon, Crater Lake Spirits expresses the pure snow-melt water, which flows over volcanic rock, used to craft the purest spirits possible. Bendis developed a filtration system using crushed volcanic rock to ensure a smooth and sweet taste. Since those early days, Bendistillery has added several vodkas and a rye whiskey to their lineup. Additionally Bendistillery’s hallmark attention to detail has spurred the Estate line of spirits, which are produced entirely ground-to-bottle on the Bendistillery 24-acre farm and distillery. Only 1,788 bottles were produced in 2014. Not a newcomer to the boutique spirits world, Bendistillery’s experience shows. They quietly win awards and earn accolades ranging from top honors at the World Beverage Competition, The San Francisco World Spirits Competition and the Beverage Tasting Institute. 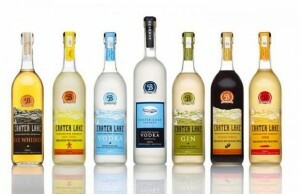 Bendistillery produces about 84,000 cases of Crater Lake spirits including Vodka, Reserve Vodka, Sweet Ginger Vodka, Pepper Vodka, Rye Whiskey, Hazelnut Espresso Vodka, Gin and Estate Gin. 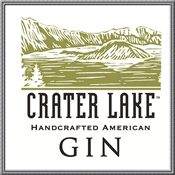 The Crater Lake brand of handcrafted American spirits will be showcased at Seattle Wine and Food Experience February 21, 2016. Stop by and chat with the Bendistillery team and sample selections ranging from their classic Gin, Rye and Vodka to Pepper, Ginger and Hazelnut Espresso Vodkas. Taste how pure Cascade water and the careful handcrafting of spirits blend to create a perfect drink.